Clear dividers are ideal for keeping stock straight and neat and so make the display more pleasing and the products appealing. The divider height needed depends on how deep the stock is and the effect you want to create. Colours can be used to brighten a presentation or highlight a product. The florescent colours take in light through the sides and the edge appears to glow This effect can be used to attract customers attention to the cabinet or a particular part of it. The black and white colours can be used with products which look appealing in themselves by removing other distractions and showing off the product. The way stock is laid out in the cabinet is also important and sloping the display can help by presenting a larger area to the customer. If you require dividers shaped to match, these can be cut for you if we know the overall length, the height at the front and the height at the rear. For more complicated shapes, a template is best. (Since dividers are not designed to be an exact fit, a cardboard or paper template is normally sufficient). Our dividers are made from cast acrylic sheet cut into panels using a tungsten tipped circular saw blade. The edges and corners which face out are then finished on a router which leaves them smooth and rounded. We can also make more complicated shapes when required, some of these are shown in the charts, but the edges and corners cut in this way cannot be finished o the router so the edges will be different to those described previously. To support the dividers and stand them upright in a cabinet we have a plastic extrusion which we supply in pieces 90mm long. These are designed to clip onto the bottom edge of the 6mm material which means they can be removed for cleaning and storage. The bottom flange is 110mm wide so that it spans the wires of the fridge shelf and properly supports the divider. The feet are supplied separate to the divider but we normally recommend that you use two feet for dividers over 400mm long to reduce the tendency of the divider moving as stock is removed from one side. The divider foot is available in white, but with the popularity of black interiors to deli and fruit & vegetable, cabinets and subsequently matching dividers, we now produce the foot in black as well. NOTE: The photo of the divider shown here has the protective paper still attached for clarity in the photo. 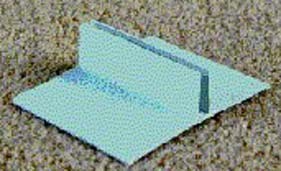 Dividers are always supplied with this paper on to protect the acrylic surface. The size and shape of the divider you will need depends on the size of your cabinet and the way you wish to display your stock. We manufacture a number of standard designs. As a guide, some of these are shown in the table below. If there is nothing here that meets your requirements, a shape can be cut to size. For simple rectangles we only need the length, height and colour. For sloping dividers we need the length, height at the front and height at the back. For more complicated shapes a template is best. Normally a cardboard or paper template is sufficient.